For those of us longing to channel our inner gourmet chef, there is a wide variety of kitchen utensils and gadgets. 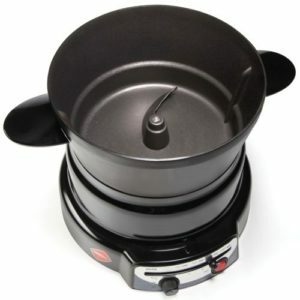 This cast aluminum non-stick electric pot measure 12 x 9 x 10-1/2 inches with a capacity of 3.25 quarts and a temperature range of 200o F to 375o F. Like every pot, it can be used to boil, simmer, sear and sauté. What’s different about this pot is the spatula built in to the base that can be programmed to stir continuously or intermittently, leaving you free to attend to more interesting tasks. Designed by Mia Schmallenbach, this set of four knives fits together like a Matryoshka (a Russian nesting doll) in your choice of a wooden or a stainless steel block. The set contains a paring knife, a carving knife, a 6-inch utility knife and an 8-inch chef’s knife. Based on the price, though (over $900 for the full metal set or $490 for a wood-encased set), many of us may prefer to stick with our Henckeles. 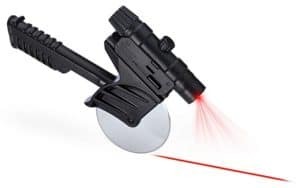 For those to whom precision is paramount, there is a pizza cutter that provides a laser light guide for slicing on an exact line. The laser scope, which also has a flashlight mode option, is detachable and can even be used on rifles with compatible rail systems (to subdue unruly dinner guests, no doubt). The down side is that unless you’re into weaponry and military gear, it’s probably not the prettiest thing you’ve ever seen. 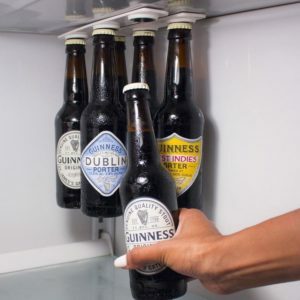 On the more practical side, the magnetic bottle loft gives a whole new meaning to the term “frig magnet”. The “loft” consists of self-adhesive strips that attach to your frig or cupboard. Each strip houses three neodymium (very strong) magnets that will grab and suspend food and beverage containers with metal lids. No more stacking jars and cans in the cupboard, hoping you won’t knock them over, no more bottles rattling around in the door shelves until they fall out, no more shoving bottles to the back of the frig and then forgetting they’re there. What a gadget for unleashing your inner Zen. Golden eggs are those that have the white and the yolk thorough mixed inside the shell. The usual method of “goldenizing” the eggs has been to crack them open in a bowl and mix beat them with a fork or a whisk. 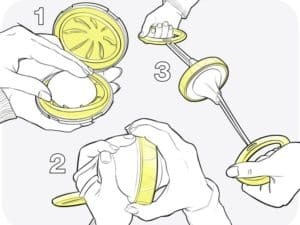 But for those who would rather not contend with preparing eggs for scrambling the old fashioned way, there is now a mechanical centrifuge that will scramble the egg for you while still in the shell. It consists of a plastic cradle with corded handles. Once you’ve placed the egg inside the cradle, twist the cradle closed and pull on the handles to set the egg spinning. And, viola, golden perfection. Gadgets and gizmos aside, the main functionality of your kitchen comes from your major appliances. If they ever need repair, call C&W Appliance Services at (855) 358-1496 for fast, friendly, and efficient service.